Texas is currently experiencing a housing boom due to an influx of people moving in from out of state. The Lone Star State has a median housing price far lower than many other states, so you can get quite a lot for your money when you move here. Some people choose to upgrade their new abode, while others choose to go for a more modest home and save the money they would have spent. Whether in search of a one story house, an in-ground pool, a movie theatre or a third floor attic, chances are when you go house hunting you probably don't turn to your realtor and ask, "Have you got anything really off-the-wall?" If you did, however, you might find yourself facing one of these creative houses. In 1987, video game developer and entrepreneur Richard Garriot (known as Lord British to fans of his game, Ultima) built a house fit for, well, a British Lord. Britannia Manor II, as it came to be known, is guarded by gargoyles, has rounded castle doors and features stained glass representations of figures from Camelot. The house is also home to both an observatory with a rotating dome, and a "dungeon" complete with a crypt full of, presumably, the skeletal remains of all those who would dare oppose His Lordship. In addition to these, the house has a slide from the interior of the second floor of the home into the exterior pool below, as well as a "grotto" with a rain feature. The house went on the market in 2013, and now is home to a new Lord or Lady. Over 50,000 beers were consumed over the course of 40 years to make this Houston landmark what it is today. In 1968, John Milkovisch, a retired upholsterer for the Southern Pacific Railroad, began inlaying glass marbles, rocks and metal into stone and redwood to create what is now known as "The Beer Can House." "I guess I just thought it was a good idea, and it's easier than painting," Milkovisch said, describing to the shiny metallic work of art in which he resides. What started as a relaxing hobby evolved into a life's work, and eventually aluminum covered the entire exterior of the Houston man's home. When asked if he drank all the beer it took to cover the house, his wife Mary replied, "No, I helped." Nestled in a quiet neighborhood near downtown Austin, artist James Edward Talbot transformed a two bedroom bungalow built in 1906 into a whimsical adult playhouse of sorts. Rather than a doorbell, Casa Neverlandia has an array of xylophones and literal bells that guests ring to gain entry. The home is outfitted with "talk tubes", PVC pipes laid into the walls that can be used for communication from room to room. Other creative aspects of the house include fire poles, an elevated footbridge and a music room with a ceiling made from vinyl records. The colorful home is not only fun, it's also environmentally sound, utilizing a rainwater collection system and solar panels for water and electricity. Elvis superfan Simon Vega built this shrine to the King of rock'n roll in the small town Los Fresnos in the Rio Grande Valley. Vega recreated Graceland's well-known music-note gates and amassed a collection of Elvis memorabilia that takes up the entire garage apartment at his home. Tours of Little Graceland are available to the public. Vega is not only an Elvis fan, he actually knew Elvis Presley and served with him in the Army while he was stationed in Germany from 1958-1960. "He was a really humble guy," says Vega. "He just wanted to be treated like every other soldier and serve his tour of duty, serve his country." Vega became a fan of Elvis in 1954 after seeing his historic performance on the Ed Sullivan Show and has been collecting Elvis souvenirs since. Including a small replication of the Tupelo home where the King was born. READ MORE: Check Out Elvis Presley's Private Jet, "The Lisa Marie"
While its address is not 1313 Mockingbird Lane, you'll still think you've stumbled into the 1960's sitcom The Munsters if you come across the Waxahachie home of Charles and Sandra McKee. The home is a near-perfect replica of the Munsters house including a custom-made reproduction of Grandpa's electric chair and a coffin phone booth. The McKees undertook this monster of a task in 2002 and consider it a "living work" because they add new details each year. The couple watched hundred of hours of Munsters footage to recreate each room in the house. The only rooms that are not from the original show are the bathrooms because those rooms were never shown on TV. 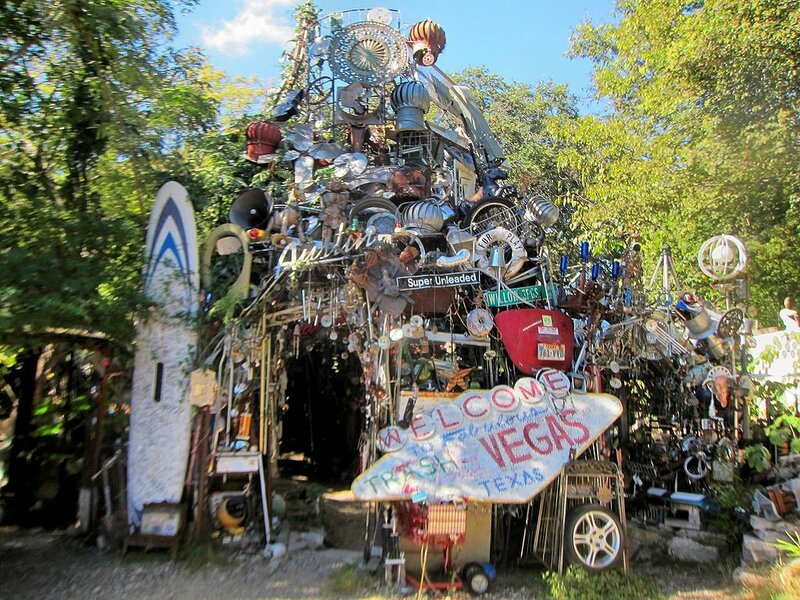 Vince Hanneman didn't set out to create what is now known as the Cathedral of Junk. The Austinite was simply puttering around in his backyard for fun. Over time, the sculptures grew into a labyrinth of old lamps, discarded bicycles, coffee pots and Vince knows what else. At one point, Hanneman took inventory of the items that make up the structure to have them printed on a t-shirt. It takes 20 minutes to read it all, he notes. Hanneman began the project in 1989 when he was in his 20's, and it all almost came down in 2000. "I tore down the three-story tower in the back," Hanneman said. He sold most of the refuse that comprised the tower, but when he couldn't disassemble the ground floor he decided to stick it out at the cathedral after all. "I decided to go less World Trade Center and more Frank Lloyd Wright". As strange as an inverted metal dome is as a beach-front home, stranger still are the unknown origins and ownership of the famous Kettle House. Resting on a quiet stretch of Jamaica Beach in Galveston, the Kettle House is a seemingly unoccupied dwelling that is, somehow, being maintained by a mysterious caretaker. 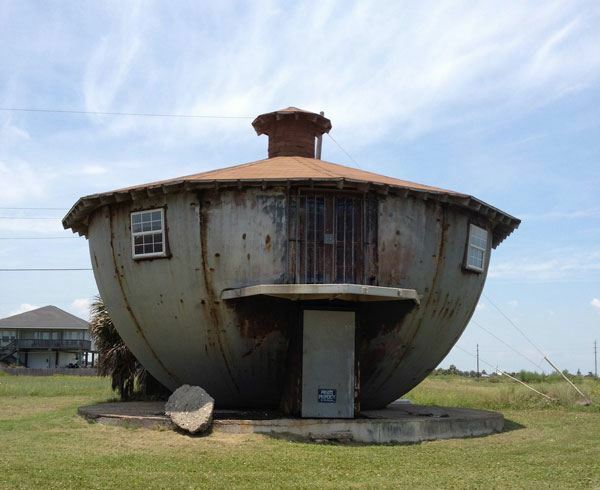 When the city of Galveston responded to neighbor complaints of the unsightly nature of the rusty dome, the home was promptly spit shined and left alone, to the chagrin of irate neighbors. 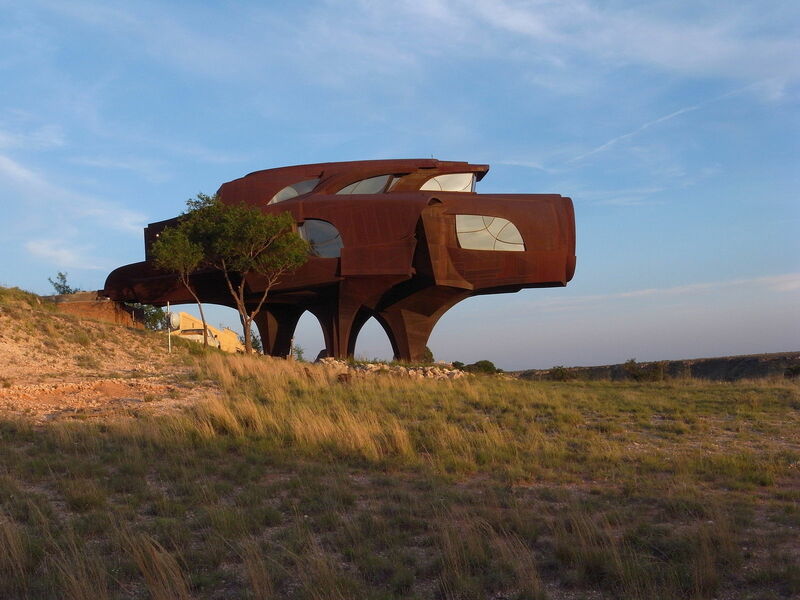 This remarkable steel house stands in an unassuming suburb of Lubbock. Built by Robert Bruno over the course of 30 years, the steel house almost defies description. It has been compared to a pig, a spaceship and a villain's lair from a James Bond film. Bruno designed and built the home himself. He worked on sections of the home for months at a time, scrapping some of the completed projects if they didn't please him. "The motivation here is really to do something that has some aesthetic value. I'm not particularly concerned about having a house," Bruno said of the home. "I built it because I like doing sculpture." At first glance, the house that stood at Montrose and Willard in Houston seemed to have been the site of some terrible disaster. Only upon closer examination would the massive cavity through the center be seen as purposeful. In fact, the home wasn't a home at all. It was a work of art. The Art League of Houston commissioned the sculpture from artists Dan Havel and Dean Ruck, and it was on display for several months before being demolished to make way for a new Art League building. The installation created a surreal effect of emptiness, as if the house disappeared into its own vortex before snapping out of existence altogether. Built in 1975, the Austin Castle House started out as a simple one-story home that was later remodeled into the medieval monolith it is today. Owner Steve Miller added in a second story and a lot of exterior work, as well as a game room with a retractable roof, and a gazebo. It may be gothic on the outside, but the interior is much more modern. The home went on sale for a cool half million in 2014 after a job relocation forced the Miller's to put it back on the market.